Use Your Time of Grace Wisely! Everyone wants to make good use of their time. And what it means to make good use of your time depends on who you are. Mike might say making good use of his time is playing video games…. With his son. Mary might say making good use of her time is watching a movie…. With her husband. But, if playing video games takes us most of your time then someone might suggest that you’re wasting time. If you’re watching a movie that ends up being no good someone might suggest that you could have done something better with those two hours. That’s why people who put on the Super Bowl hope the game isn’t a blow out, but a close game so that people will watch the game, and the commercial, more intensely. Spend Your Time Of Grace Wisely! Some use their time to watch the news. When they are reporting on a very graphic crash they might say, “Warning! This scene is very graphic!” That was the case in the gospel lesson for today. Let’s suppose the Galileans were faithfully coming to offer their sacrifices to worship the Lord. Can you hear the people’s questions? “I wonder why God let’s bad things happen to good people?” or “What kind of a loving God allows such a terrible thing to happen to faithful people?” Jesus knows. Jesus’ answer addresses a common misconception of the Jewish people. They thought that when bad things happened the people must have been really bad people and deserving of such a punishment. You saw the same thing when Job’s friends came to help Job come clean when he lost his wealth, health, and children. His friends were convinced it was because Job at worst—had done something horrible wrong to get on God’s bad side; and at best—hadn’t been faithful. This includes everyone! Therefore, God has to give us the solution! All sinners need to be turned away from sin, death and the devil to the holiness that is in Christ Jesus. Jesus is the one who met the wrath of God deserved pictured at the animals sacrifices in Jerusalem (life must be paid for sin), or at the cross where Jesus paid for the sins of all people. This is Jesus’ point that needs to be driven into the hearts and minds of all people: Use Your Time of Grace Wisely and Faithfully Follow your Savior Jesus! We are tempted to forget what God’s Word says about our Time of Grace. We are tempted into the same thinking of the people in Jerusalem. Tragedy strikes someone who you’ve always thought lived a pretty shady life and you think, “Well, they had it coming!” You heard about the shootings in places of worship and thought, “They don’t worship the true God, so…” I remember when Hurricane Katrina hit New Orleans instead of Houston and some people kidingly said, “They needed a good flushing!” Maybe you thought those sinful people deserved those things. All the while you’re sitting back and ignoring the use of Your time of Grace in your own life. You’re wasting your time if you’re not organized and don’t have things planned. We don’t have to plan the things we like to do, but we have to plan the things we don’t like to do. Yes, there’s a struggle because sin has infected the perfect use of time as God intended. Those who have lots of time, wish they had something to do. And those who have lots to do wish they had some more time. So, we struggle to faithfully, but not hectically, manage our time. Point of thought: Jesus never hurried anywhere, but he accomplished what he came to do because did all things perfectly faithful. I know how it goes….. Your “idle time” moves slow. However, your “busy time” moves fast. I guess Einstein was right—time is relative! LOL! For the times we have not managed our Time of Grace well, we repent, as Jesus encourages us, and trust in his forgive so that we don’t perish! Use your Time of Grace to not only forsake sin, but also to be turned to Jesus. There is no missing Jesus’ point: unbelievers have no excuse revealed by their lack of fruit. If there is no faith, then there is no fruit. And if there is no fruit, God will be patient, but his patience is not eternal. 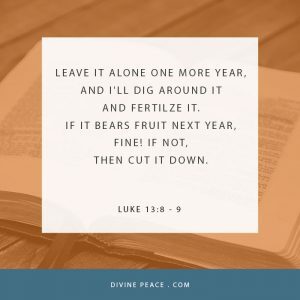 In context Jesus was talking to “fruitless” Israel. But, we could substitute ourselves in the parable. God expects to see fruits in your life. He looks for good works, that is, those things we do according to his holy will as revealed in the 10 Commandments and the rest of the pages of Scripture in your life. These God-please fruits of faith reveal to you and those around you a real healthy faith in Jesus. No fruit bears evidence of a spiritually dead person that will end up being cut down and thrown in eternal flames of hell. The urgent call from this parable is also clear: Be Fruitful in How You Spend Your Time of Grace! But, our second lesson for today from Corinthians reminds us that God’s patience does come to an end. So, don’t take God’s patience and our precious Time of Grace for granted. No, let’s repent and be fruitful! In the management of time let us rest secure in the promises of God. In Jesus who managed time perfectly for you to give you full forgiveness of all your sins. Yes, Lord, dig around my roots, one more day to bear fruit for you, to share Jesus with others so they can have what we have. That means we will have to bear some crosses in life, but not without the strength that Jesus has already provided by bearing our eternal punish for sin on his cross. I know some of you will use your time to play video games, and others to watch movies, but let’s all be sure to use our Time of Grace faithfully and fruitfully in thankful service and love to our gracious God for the sake of other who don’t yet have what we so enjoy. Yes, management your time of grace now as you prepare to enjoy God’s time for eternity in heaven. But, that’s a whole ‘nother sermon, and I don’t have time for that. Amen!